Not to mention its cheap! The idea is simple: Massively scale up a schematic circuit from the text book such that the component symbols can be easilly seen across the room. Now break up the schematic so that you can actually move symbols around on the board easily, disconnecting and reconnecting them. Finally, mount the REAL components onto the component symbols so that as you play with the parts, you are building REAL WORKING CIRCUITS! They accomplished this feat using large pieces of felt, which are soft, flexible, and easy to care for. And VERY COLORFUL. You could also do this with cardboard or plastic cards, but that is more work up front cutting and painting (especially on plastic) and ends up being LESS fun for the students in the end. To make the connections, HackerSpace Charlotte found some really cool magnet rings. 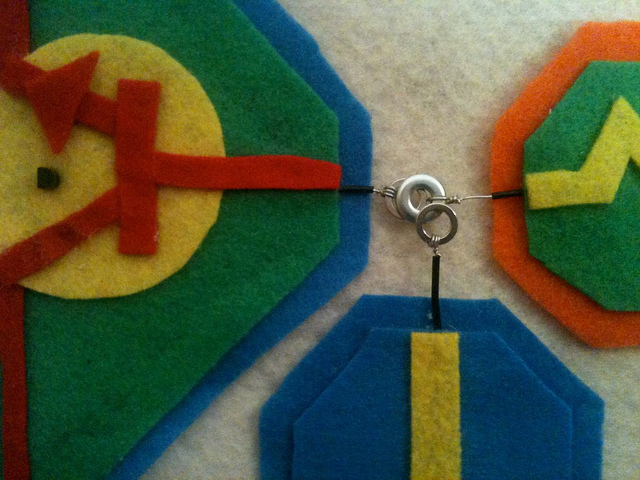 Just slap the felt peice onto the chalkboard (it has magnets behind it to hold it up) and slap the magnet ring legs of two adjoining parts together! SO SIMPLE. 1: Like I said, it hits the key points in designing and building good educational gear - students want to look at it, want to touch it, and want to play with it. 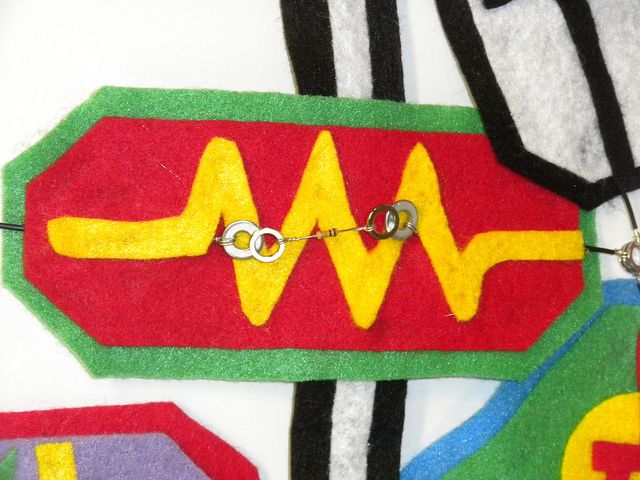 3: The felt circuit relates DIRECTLY to the schematic in their text book. The images are huge and easy to follow, even from the back of the class. But hey, you move in closer, and you see the REAL DEAL component doing it's job. And if you fail, and blow up that LED, it is so EASY to replace. In fact, you are encouraged to blow it up. 4: Those magnet rings are just perfect. I love them. The spring boards were fun, but they always shreaded the ends of the wires after time. Also, the spaghetti mess of wires over the top of the component board got to be a hassle to peck through on larger schematics. One cheaper kits, the springs fell out or got rusty. There seems to me to be a certain satisfaction when you slap the part up on the board and those leads just snap together. Its reassuring. "Am I doing this right?" ::clack:: "Oh. Apparently I AM!" A few motivated science teachers can get together and knock out a large bin of components in a weekend. And they would have a BLAST doing it. And it wouldnt cost an arm and a leg. In fact, a complete class demo set could be made up for less than the petty cash limit in the Principal's office. Six sets (enough for an entire class) would cost less than your school's monthly office supplies budget. The only expensive part of the kit (and arguably my favorite "component") is the VOLT METER! This Arduino powered volt meter uses a servo and a large plastic arm (likely a straw, or something else lightweight) to make an absolutely HUGE voltage indicator for your chalkboard. Watching it swing up and down as the teacher touches parts of the circuit will be thrilling. If HackerSpace Charlotte and Element14 do not market this into a product soon, someone else will jump on it. Thankfully, everytime someone jumps on an idea like this, they manage to mess it up by "improving" on something that is already perfect, leaving Charlotte and E14 still holding the golden goose. I look forward to placing my order for a few kits as soon as they get them ready.